Jackie Tyrrell wants to play again next season, if he gets the nod from boss Brian Cody. Jackie Tyrrell confirmed the news on TV3. KILKENNY’S JACKIE TYRRELL has indicated that he wishes to play for the All-Ireland senior hurling champions again in 2016 – if selected. 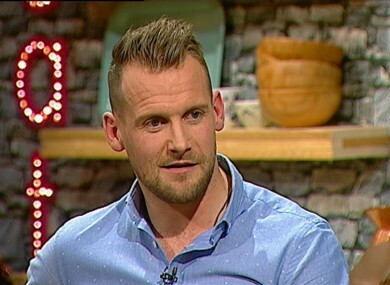 Tyrrell, 33, was ruled out of the All-Ireland semi-final and final with a foot injury but told Martin King and Lucy Kennedy on TV’s The Seven O’Clock Show that he is recovering well and has more to give in the black and amber. “The foot is good; the screw is still in it at the moment,” said the 9-time All-Ireland SHC medallist. “I recently got good news from the consultant so, things are good with my foot and I’m feeling fresh so if management feel that I have a role to play next year, then I’m very much up to the challenge and I’d love it again. “You’re constantly looking for the next challenge. It’s one of those things, I’d love to go back and get another go but it’s not all in my hands. Jackie Tyrrell with TV's Lucy Kennedy. Tyrrell’s rousing half-time speech in the All-Ireland final was referenced in the aftermath of the victory over Galway. The James Stephens man was a helpless onlooker but played his part in the dressing room at the break. “I suppose when you’re there a while, you get that bit older and have that experience and you do try to look out for the lads. Tyrrell also offered his views on former Cork goalkeeper Donal Óg Cusack’s new role with the Clare senior hurlers. “Yeah everyone was surprised. Donal Óg is an iconic figure in the GAA world, he’s a hugely, deep thinking hurling guy. “So it’s just the dynamic of how himself and Davy Fitz will get on. If they could blend and get on for the sake of Clare hurling then it could be a great move for him because Donal Óg will bring a wealth of experience and professionalism to that set up and he’ll probably think outside the box which Clare probably lacked. “You know when they had their sweeper system and that became unstuck, they had no real plan B so Donal would think all that out and if the different scenarios come up, what way would they come around different teams. ‘The Seven O’ Clock Show’ airs weeknights at 7pm on TV3. Email “Boost for All-Ireland champions Kilkenny as key defender commits for 2016”. Feedback on “Boost for All-Ireland champions Kilkenny as key defender commits for 2016”.